Family Excursion Game: Spending quality family time together is very important. A strong family finds that opportunities for quality time emerge from quantity time: The more time you spend together, the better chance you have of sharing quality experiences. Eating a meal together is a great way to spend quality time with your family. But, Heather and her family decided to spend the weekend together doing something different than the regular family weekends on the dinner table. So they have picked a perfect place to spend one family weekend in the surrounding nature. They arrive on the spot. It is near one mountain village and it looks like a perfect spot to place a tent. Here they can enjoy the beautiful landscape and the fresh air. They will make sure that they take in the nature they pass – trees, plants, and animals. Would you like to join them? 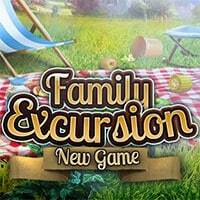 So enjoy and have fun in playing Family Excursion Game.